Did my garden give my dogs cancer? A distraught dog owner has today called for urgent tests to see if her home was built on contaminated land after her two pets were both diagnosed with cancer. Emma Sheppard’s Yorkshire Terrier, Alfie, died of lymphoma while her Labrador, Jess, has terminal mouth cancer. She fears both conditions were caused by the dogs eating grass in the back garden of her Thornton home, which was built on the former ICI site. Tests carried out before the Hawley Gardens development began, including her Alder Lane home, found contamination at the site that ‘may be unsuitable for garden soils’. 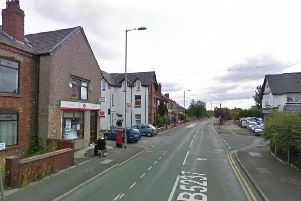 Her landlord has put her complaint on hold until Wyre Council has dealt with the issue. Although the land was professionally remediated to ensure the soil was safe, Mrs Sheppard said she fears there are still deadly chemicals lurking in the garden. She said: “I overheard somebody talking about how her animal had died on the same site, although I didn’t think anything of it at the time. She moved into the house with her husband and two children in June 2014. In a letter to her landlord she said they ‘soon became aware’ of a problem with the garden because the grass was not growing properly. She described it as ‘heart-breaking’ when her dog Alfie, 12, was put down in October last year after developing lumps in his throat. Although she originally put that down to his age, despite having no previous health problems, she is now convinced there is a problem with the garden. Documents filed with Wyre Council during the planning process for the site confirm carcinogenic chemicals were found during tests at the site before it was developed. However conditions were attached to the planning permission to ensure the land was made safe before building work began. The Gazette understands the landlord, which bought the land from the developers, has provided details of the purchase and guarantees it received to Wyre Council. A spokeswoman for Wyre Council said: “The council can confirm that an enquiry has been received in relation to the land recently developed and known as the Hawley Gardens Development. “The council can confirm that conditions requiring the detailed investigation and subsequent remediation of the development site were attached to the consent for development. “Those conditions have been since been discharged by the council in respects to Phase I of the development, which is now complete. “Works associated with Phase II of the development site which is not yet complete, are still underway. Ian Hilliker, Technical Director at Barratt Homes, said: “The house in question was sold to Great Places Housing Association on 21 December 2012. “The Hawley Gardens site was remediated by a specialist contractor before house building began. “The contractor’s work involved removing ‘hotspots’ of contaminated material before applying an inert, clean capping layer to the site. “Once houses are built, an additional layer of clean subsoil and topsoil is imported to all garden areas to complete the capping exercise. “As is the case with the many brownfield sites upon which we build, the strategy was approved by regulators and is validated by independent consulting engineers upon completion. The validation reports include soil test results and are submitted to, and checked by, regulators. “Of course, we have no knowledge of activities within the garden in question between 21 December 2012 and Mr and Mrs Sheppard purchasing it from Great Places in 2014. “Having become aware of this issue, we wrote to Mr and Mrs Sheppard on January 8 explaining the remediation process. The local authority environmental health department is investigating and we have fully cooperated. “Turf can fail to establish on a new site for a number of reasons and is often replaced in such circumstances. “In terms of remediation, all work done on the site to date has been tested, validated and approved by regulators.